Mikrotik brand devices (www.mikrotik.com), which runs the RouterOS operative system, are worldwide known and popular with a high networking market penetration. Many companies choose them as they are a great combination of low-cost and good performance. 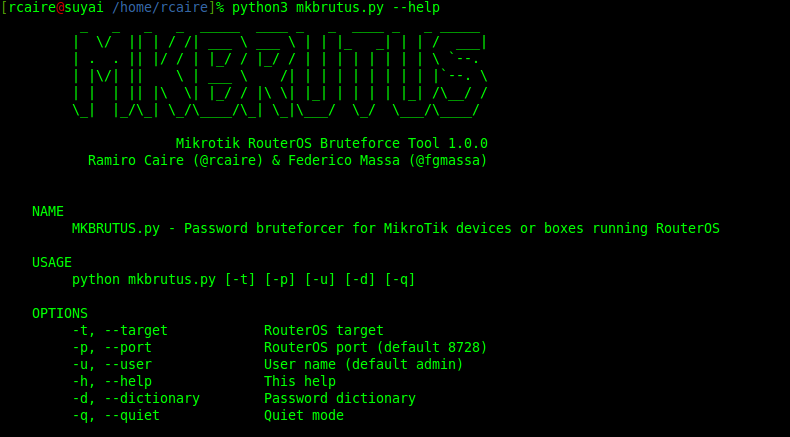 RouterOS can be also installed on other devices such as PC. Both, Winbox and API ports uses a RouterOS proprietary protocol to "talk" with management clients. It is possible that in the midst of a pentesting project, you can find the ports 8291/TCP (Winbox) and 8728/TCP (API) open and here we have a new attack vector. Because the port 8291/TCP is only possible to authenticate using the Winbox tool (at least by now ;), we realized the need of develop a tool to perform dictionary-based attacks over the API port (8728/TCP), in order to allow the pentester to have another option to try to gain access.